A popular tourist destination, Disney’s Paradise Pier® Hotel attracts the Disneyland® Resort crowd, serving guests from all over the world. Reducing food waste is an important aspect of Disney EnvironmentalityTM (The Walt Disney Company’s mantra for thinking and acting with the environment in mind), and something the hotel takes great pride in. The hotel’s approach to food waste is: Prevent, Donate, Divert. Since implementing organics recovery several years ago, captured pre-service and post-service food waste is sent to an external vendor for conversion into animal feed amendment. In addition, the hotel donates unused prepared food from restaurants and banquets to local food banks. Reducing food waste is an important aspect of Disney EnvironmentalityTM, and something the hotel takes great pride in. 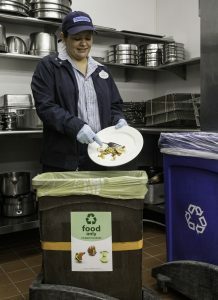 Participation in the WWF Food Waste Pilot helped spotlight food waste efforts at Disney’s Paradise Pier® Hotel, with restaurant and banquet teams reevaluating existing practices. A project team was established to review pre‐ and post‐service food waste separation processes, equipment/signage standardization and placement, and develop a measurement approach. Steward roles were designated to oversee execution of pilot activities. Pilot participation helped raise awareness around the importance of food waste reduction and recovery. Disney’s Paradise Pier® Hotel is part of a broader effort at the Disneyland® Resort to cultivate Environmentality. The Disneyland® Resort has institutionalized a food scraps program with over 80 participating food & beverage locations, collectively diverting over 4 million pounds of food waste from landfill annually. The hotel also participates in a variety of initiatives to reduce their environmental impact, including: various waste minimization, reuse, and recycling programs, sustainable sourcing practices, water conservation, and energy efficiency measures. In 2017, Disney’s Paradise Pier® Hotel, along with Disney’s Grand Californian Hotel® & Spa, and Disneyland® Hotel each earned the “Environmentalist” certification from the California Green Lodging Program. This certification represents the State’s top rating for travelers seeking green lodging.